Is your local workforce prepared for Industry 4.0? Or is your area mired in a skills gap crisis with available, high-quality careers but too few qualified candidates? 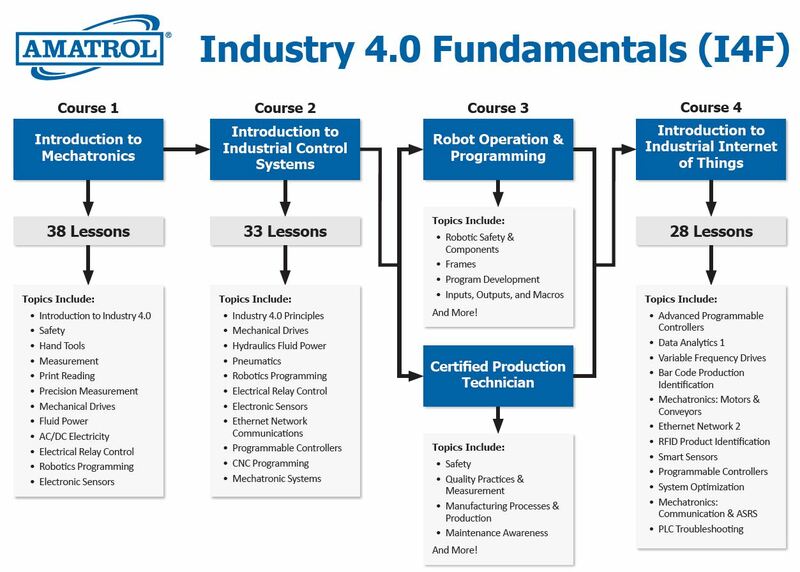 Amatrol’s Industry 4.0 Fundamentals (I4F) is a high school-based program that prepares students for high-paying Industry 4.0 careers in local industries. Amatrol provides pre- and post-lesson quizzes, as well as classroom-based skills performance assessment. The quizzes help learners to understand where their competency is weak or strong and how much they’ve learned from the lesson. The performance assessment evaluates how well a learner performs the hands-on skills. To learn more about Amatrol’s eAssessment, click here. Amatrol’s eLearning offers flexible technical training through superb technical content depth as well as breadth and strong interactivity for skill development with 24 x 7 access. Eye-popping graphics, 3D simulations, videos, and complete explanations combine with strong interactivity to develop technical skills for modern Smart Factory manufacturing training. To learn more about Amatrol’s eLearning, click here. Amatrol’s Virtual Training uses virtual simulators to replicate hands-on equipment in such great detail that learners will feel like they are using the actual equipment. Learners perform essentially the same tasks using virtual trainers that they would using the hands-on systems. To learn more about Amatrol’s Virtual Training, click here.